Under the General Data Protection Regulation (Regulation (EU) 2016/679), the European Commission has the power to make decisions in certain areas by way of "implementing acts", subject to approval of the relevant act by a committee under Art. 93(2) of the GDPR - which will no doubt become known as the Article 93(2) Committee (or Article 93 Committee). 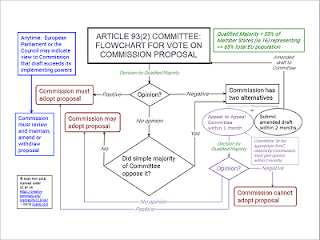 When considering proposals by the European Commission, this Committee must use the "examination procedure" under the EU "comitology" process, governed by Regulation (EU) No 182/2011 - the same procedure that the Article 31 Committee under the current Data Protection Directive must use. Below is a flowchart I prepared showing the Article 93(2) procedure. Click on the small image below to download the full PDF flowchart (note: amended 2 June 2016 to expand on what "positive", "negative" and "no opinion" mean). The areas where the Article 93(2) Committee procedure applies are as follows; some are quite significant so it's important to know how the procedure works. Specifying the format and procedures for the exchange of information between controllers, processors and SAs for binding corporate rules (BCRs) – Art. 47(3). Implementing acts of general scope to specify arrangements for exchange of information by electronic means between SAs and between SAs and the European Data Protection Board - Art. 67.